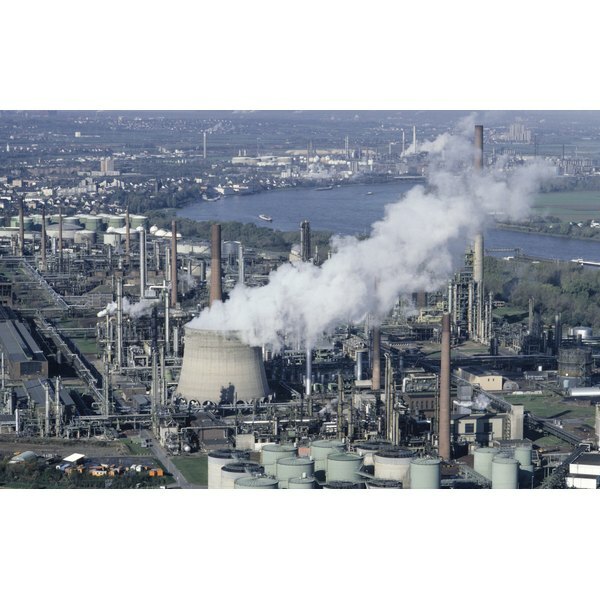 While air and water pollution may receive the bulk of the headlines, pollution of the land or soil is as serious a threat to the world, according to the environmental news website Scipeeps.com. Land pollution has many sources, all of which relate directly to the activities of human beings. Environmentalists, like those at the Sierra Club, say that as humans continue to pollute the soil, they are inadvertently poisoning themselves. Human activities that pollute soil include the application of herbicides, use of pesticides and insecticides, inappropriate disposal of garbage and urban over-development. Land pollution is also caused by the dangerous disposal of harmful toxic wastes, from the careless dumping of waste oil from cars to the organized but potentially dangerous dumping of radioactive by-products from nuclear energy plants. Herbicides were developed to help farmers and government agencies control weeds. Farmers applied the first herbicides to soil in the United States as early as the 1920s. Since then, herbicides have become an important part of agribusiness. However, according to the National Academy of Science’s Institute of Medicine, herbicides that kill weeds also harm people, causing as many as 44 specific diseases and disorders, including cancer. In the same manner as people use herbicides to control vegetation, they apply chemicals to prevent or kill pests and insects. The pesticide DDT, for example, nearly wiped out many species of birds, including eagles, before it the U.S. banned its use in 1972. The journal Pediatrics reported in 2010 that there might be a link between pesticides and Attention Deficit Hyperactivity Disorder (ADHD). In an article published by the Kansas Department of Health and Environment, Professor Thomas Bridge says that water percolating through garbage dumps and landfills can introduce toxins like arsenic into groundwater, causing a host of illnesses including birth defects. A “60 Minutes” broadcast in 2008 reported that “e-waste,” garbage produced by improper disposal of computers and other electronic devices, introduces toxic chemicals like lead and cadmium into the water tables through leaching. Businesses large and small have been improperly dumping waste products into the ground for decades, according to the Sierra Club. Large factories have been dumping toxic by-products into private landfills, while small businesses like automotive service stations and dry cleaners have been dumping waste out in their own backyards. All these toxic chemicals eventually leach poisons into the water table, where humans consume them through drinking water or eating contaminated foods like freshwater fish. While the United States government continues to try to manage the disposal of spent fuel rods from nuclear power plants, environmentalists warn that even super-disposal facilities, like Yucca Mountain in Nevada, are potentially toxic to human beings living in the region. Members of YuccaMountain.org say rules set by the Environmental Protection Agency to govern sites like Yucca Mountain are not adequate to protect humans from exposures to radiation, which can cause cancer and birth defects. The way humans use land is also creating a form of land pollution, in the form of urban development blight, according to the Sierra Club. People are causing blight pollution by exhausting soils of necessary nutrients by over-farming, and by over-building concrete and asphalt surfaces such as roads and parking lots. The Sierra Club says this kind of development blight affects the quality of life for humans, by creating temperature and humidity extremes, visual glare, mental health issues, impaired water run off and leaching of minerals into the water table.